The buildings on the north bank of the river stand out well in my father’s photo, he had timed the sun perfectly. Shell Mex House, the Savoy, Waterloo Bridge and Somerset House provide a contrast with the south bank of the river. 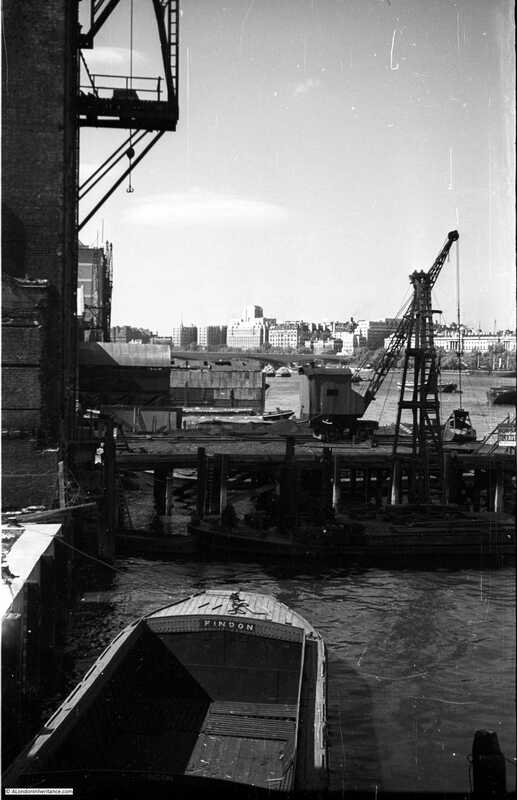 In 1952, the south bank of the river was still an industrial landscape with warehouses lining the river’s edge and jetties sticking out into the river. All this has long since disappeared and the occasional remains of some of the jetties can be seen above the water, or on the muddy edge of the river at low tide. Whilst the south bank of the river has changed dramatically, the north bank along this stretch of the river has hardly changed. A closer examination would show there have been cosmetic changes to the buildings, but at this distance the view looks much the same. Blackfriars Bridge is the second bridge across the river at this location. 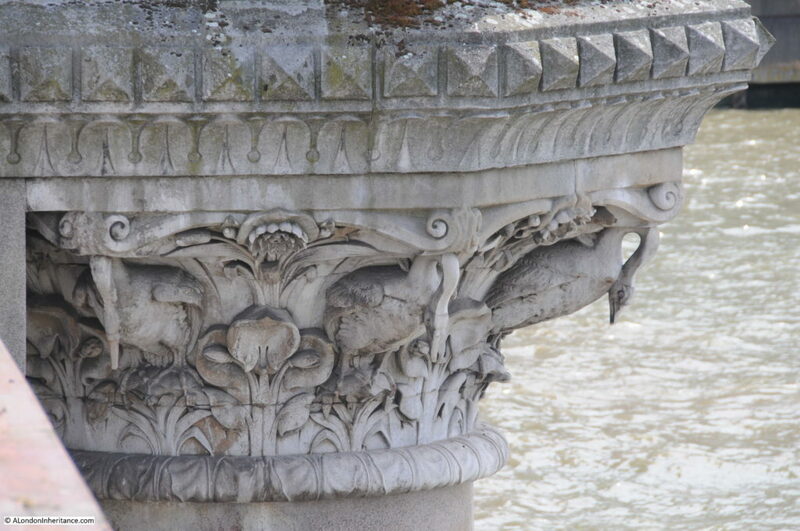 It was designed by Joseph Cubitt, who was also responsible for the original Blackfriars Rail Bridge, the columns of which can still be seen in the river between the road bridge and the later rail bridge. 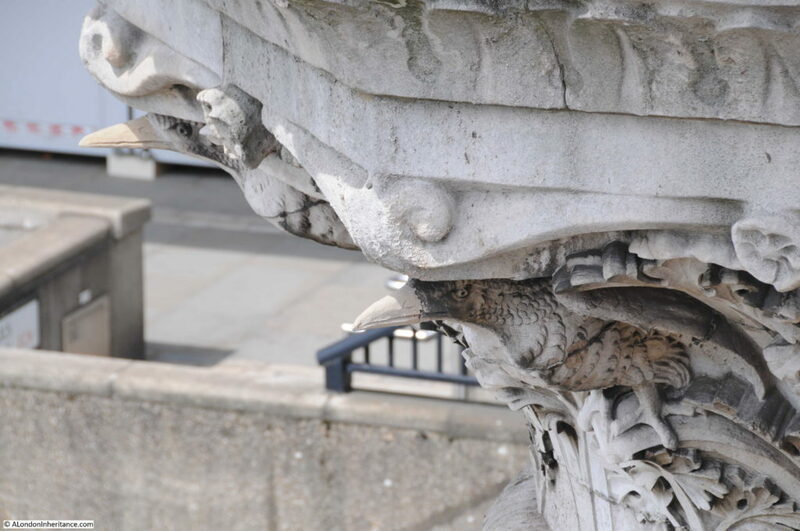 It was opened by Queen Victoria in 1869, on the same day as she opened Holborn Viaduct – a perfect illustration of how much development of the city’s infrastructure was taking place in the later half of the 19th century. The top of the bridge is rather plain. The view to the east is obscured by the Blackfriars Rail Bridge and the new building work along the top of the bridge. To the west is the open view towards Waterloo Bridge along the stretch of the river known as King’s Reach. 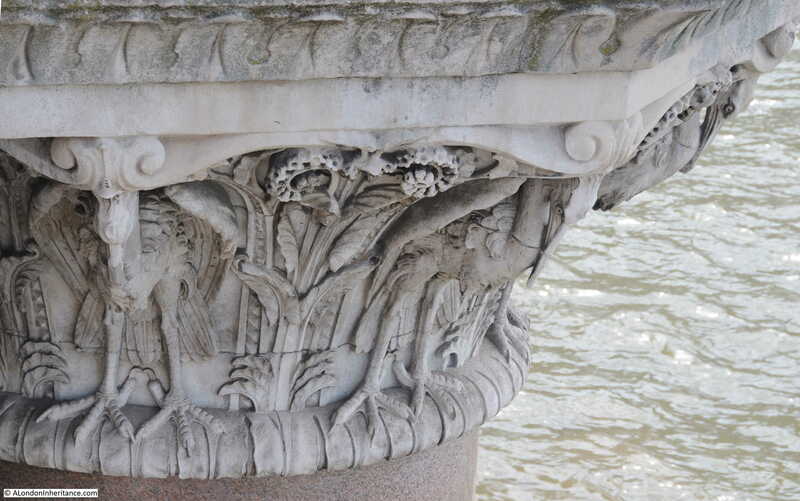 It is always interesting to look over the side of a bridge, and if you peer over the edge and look at the tops of the columns supporting Blackfriars Bridge you will find a series of beautifully carved birds. 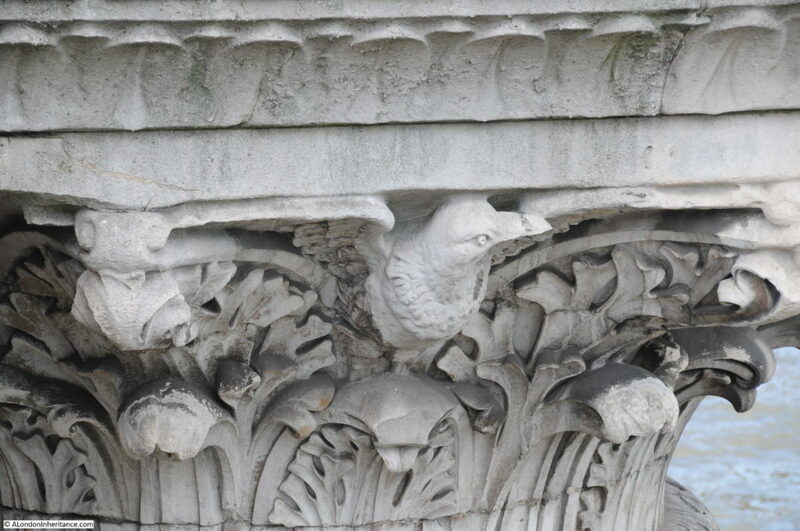 These were by the sculptor J.B. Philip and are carved in Portland Stone. The birds along the west-facing side of the bridge are apparently fresh water birds and those on the eastern side of the bridge are salt water birds. 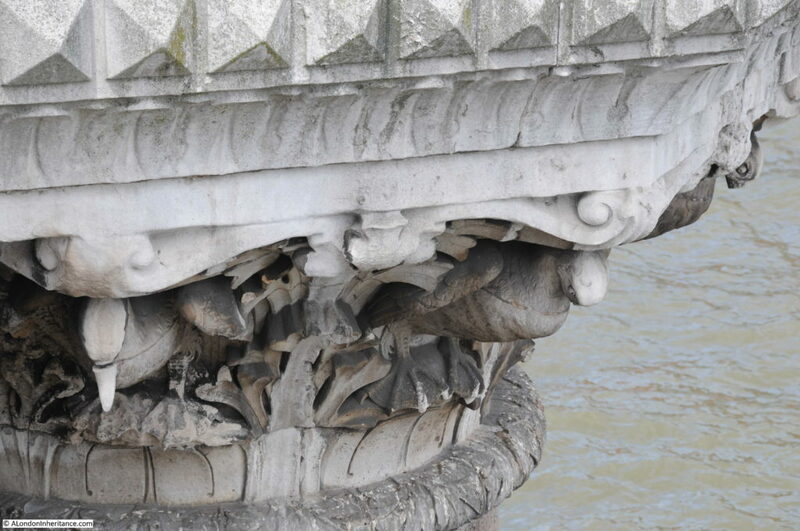 I have read that the bridge marks the boundary of salt water penetration up the Thames, however I doubt this is correct, or that there is a clear boundary. The Port of London Authority puts the boundary of river water and salt water at Barking, however this will move up or down river dependent on tides and the volumes of fresh water coming from the upper Thames. Theoretically, the river could have a gradually reducing salt content all the way to the tidal limit at Teddington Lock. A plaque at the north-eastern corner of the bridge records that the current Blackfriars Bridge is on the site of the original 1760 bridge which was named after William Pitt the Elder who was Prime Minister during the construction of the bridge from 1760 to 1769. 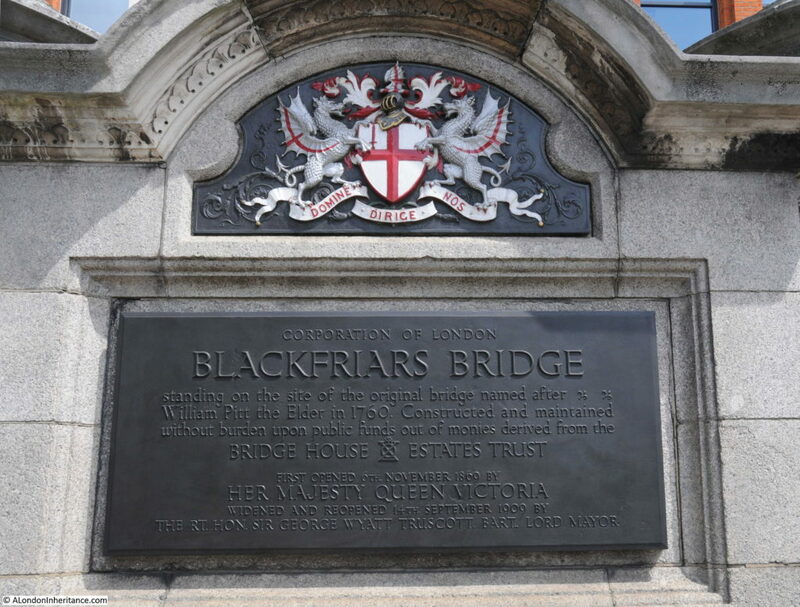 The name did not catch on and the location of the bridge gradually gave the name to Blackfriars Bridge. The plaque also records that the bridge was widened in 1909. This was done by adding 9 meters on the western edge of the bridge to allow tram lines to be run across the bridge. 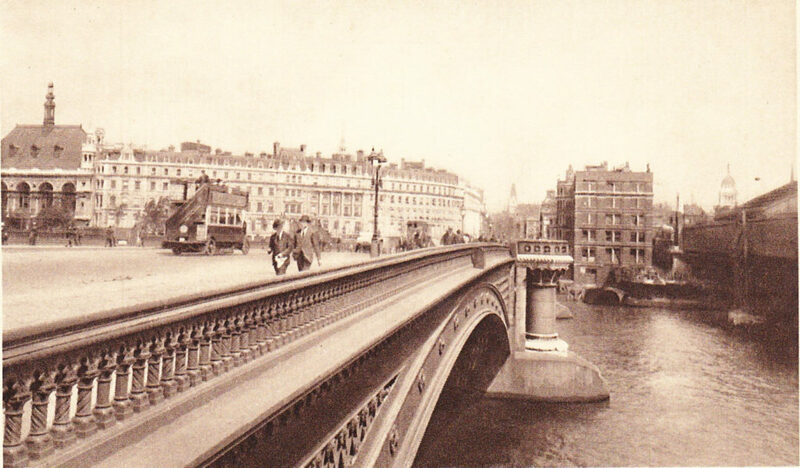 The following postcard shows a bus running along the western side of the bridge. The last time I took photos along the bridge was in 2014 and the building at the north-east corner of the bridge was empty and boarded up. I was rather worried about the wonderful fountain in front of this building after seeing building work and construction hoarding hiding the fountain from the pavement. The fountain was provided by the Metropolitan Free Drinking Fountain Association and erected by the Association in July 1861 by the Chairman Samuel Gurney MP. 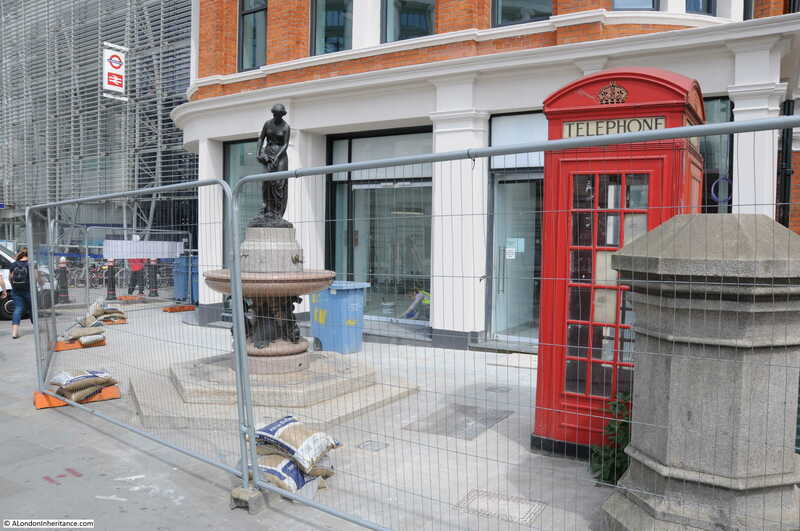 The hoarding is now coming down with wire fencing remaining and it is good to see the fountain still looking good after 156 years. I have always been fascinated by the River Thames. 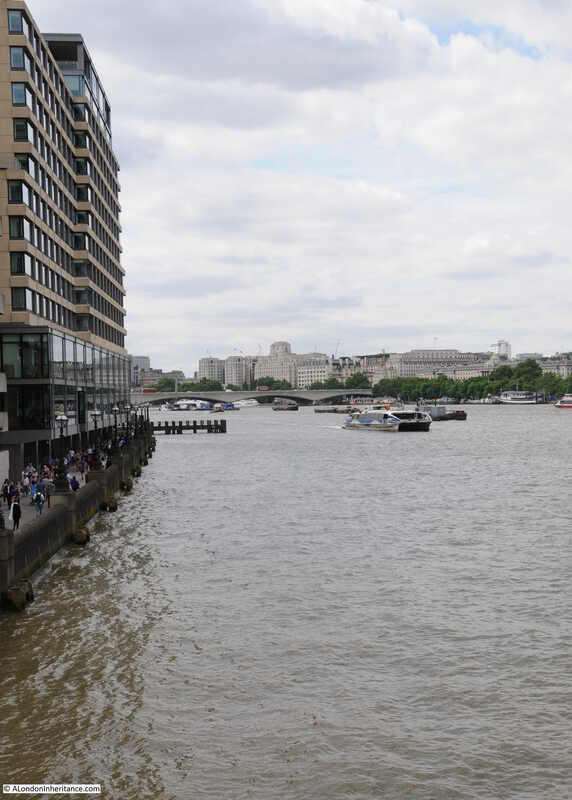 Despite being the reason for London being where it is, and for the success of the City, today the river is often seen either as a flood risk or as a valuable scenic addition to the luxury apartments that continue to line the river. 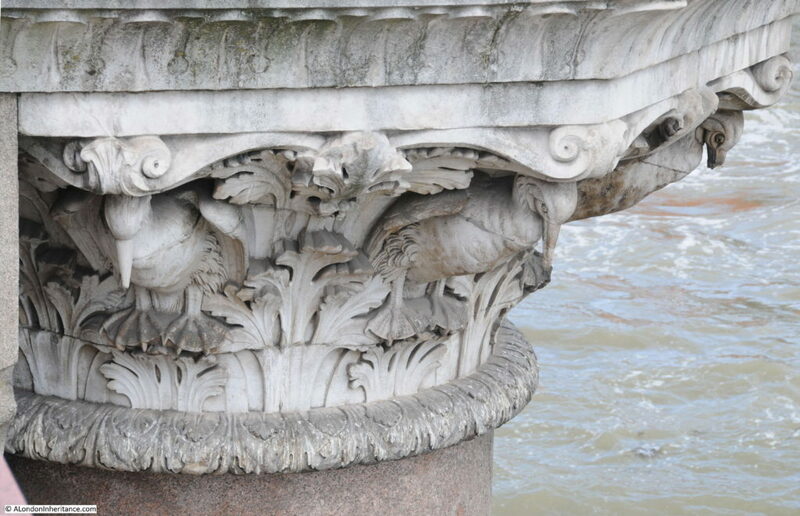 Blackfriars Bridge is a means to cross the river, however the birds along the edges of the bridge acknowledge the river and the differences between the upstream and downstream sections of the river, pointing inland or down to the sea. The birds show that the river is not just a barrier to be crossed, but a living part of the city’s landscape. This entry was posted in The Thames and tagged Blackfriars Bridge, River Thames on July 23, 2017 by admin. There are names that keep coming up whilst exploring London’s history, and this week’s post is about one of those names, Sir Polydore de Keyser. 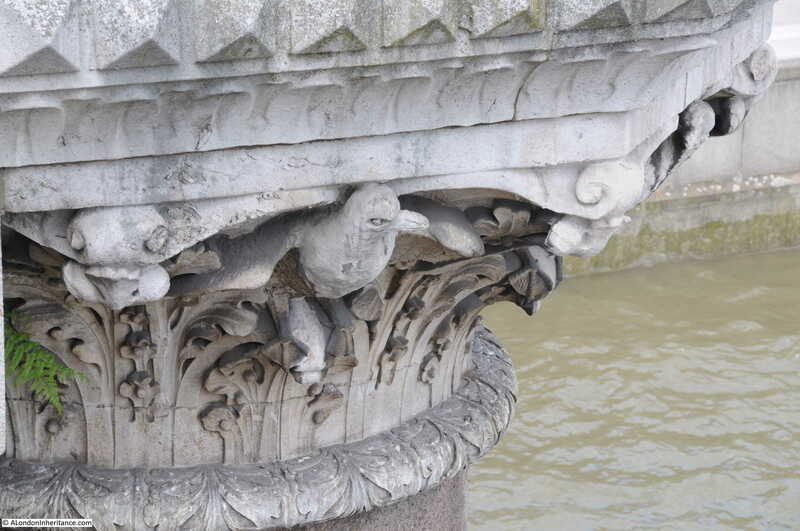 I first came across him whilst writing about the area directly to the north of Blackfriars Bridge. Then a few months ago, my blog started to get a number of redirects from the Guardian website from an article about the Supreme Court judgement on Brexit – a judgement in which de Keyser’s hotel was referred to several times. I also recently found Polydore de Keyser again during a walk through Smithfield. So who was Polydore de Keyser? There does not seem to be much written about him, so I thought a read through some old newspaper archives might shed some light on this interesting character with the foreign sounding name, and from the above plaque was Lord Mayor in 1888. I found the fascinating story of an immigrant from the Continent who reached the highest of offices in the City of London, but who also faced continual criticism because of his origins. Polydore de Keyser was born in 1832 in the Belgium town of Termonde (the French name or Dendermonde in Flemish) in the north west of Belgium between Brussels, Antwerp and Ghent. He moved to London in 1842 with his father, Constantin de Keyser and mother, Catharina Rosalia Troch. His father had been a teacher in Belgium, but on arrival in London he purchased a hotel which he renamed de Keyser’s Royal Hotel. A strange career change and I have been unable to find any references as to why the de keyser’s moved to London and took up the hotel business. “THE LIQUID HEAVEN of the Germans – Who that has tasted the delicious ‘Maitrank’ or May drink of Germany, can ever forget it. Poetic in name, and inspiring in its essence, it is the wine of wines. the exquisite flavour of that lovely mountain flower – the Waldschloschen appears to be heightened by its being wedded to the juice of the grape, and may well the refined connoisseur hang upon the memory of its tempting fragrance. The worshippers of this nectar have become almost frantic with delight by the announcement that a Herr Polydore de Keyser has succeeded at length in imparting to it the additional charm of effervescence, a right sparkling attribute, which it alone required to bring it to perfection”. Orders were requested to be sent without delay to either Polydore de Keyser of 24 Cannon Street, London, or to his agents across the country. Maitrank could be purchased for 72 shillings per dozen. Also in 1856, Constantin left the running of the hotel to his son Polydor. He does not seem to have been involved in any activities that justified a newspaper article for a number of years, he was running his hotel and probably getting involved in societies and good causes in his local area and that justified an interest due to his background. In 1866, at a meeting in St. Ann, Blackfriars, Polydore de Keyser subscribed £2, 2s to a testimonial to acknowledge the service of Mr. R.E. Warwick who had “for many years past has endeavored to obtain a better distribution of the charges for the relief of the poor in Unions”. At the meeting, other subscribers included the Mayor and Alderman so de Keyser was moving amongst those who managed the running of the City. A year later, de Keyser was perhaps using his European contacts as he was acting as a steward for an anniversary celebration for the German Hospital in Dalston, held in the London Tavern on Bishopsgate Street. Polydore de Keyser already had a hotel in Blackfriars, the hotel that his father became the proprietor of when he arrived in London. This was the Royal Hotel, in Chatham Place, New Bridge Street, Blackfriars. I cannot find the exact location of his original hotel, however I suspect it was part of the block on the left of Chatham Place as this is where his new hotel would be built. Newspaper reports help provide an idea of the way local commissioners and wards worked, and how complaints could be resolved. In the London City Press on the 26th March 1870 there is a report that he was summoned before the Commissioners of Sewers. He had been summoned to explain why he had not carried out a number of works to his hotel to make it safe. There was a crack in the hotel but it had been filled in years before and had not changed since. The charge was thrown out on the grounds that Alderman Stone found the building was not dangerous and that the complaint by a Mr Power was malicious as de Keyser had apparently made an earlier complaint against him to the Commissioners of Sewers. “IMPROVEMENTS AT BLACKFRIARS – In the background of the Victoria Embankment there are many ugly spots, which can only be beautified by the enterprise of private individuals, the Metropolitan Board of Works having no authority over the unsightly looking places alluded to. One of the chief eyesores is the ungainly group of gasometers at Blackfriars Bridge, and it would certainly be a pity if such monsters should remain in their current position. 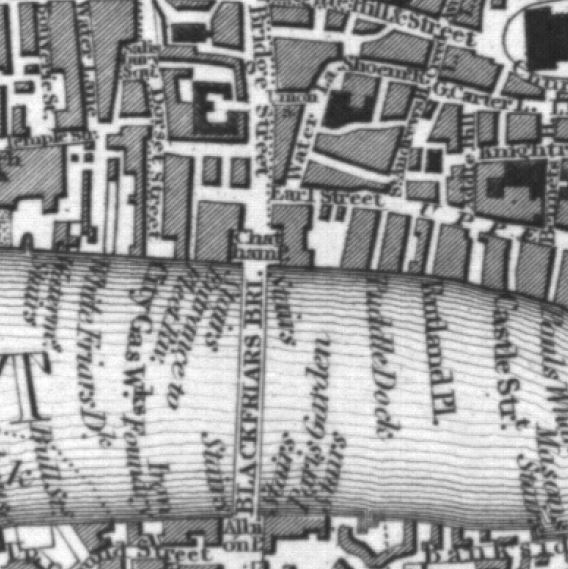 It is gratifying to know that they will cumber the ground where they are reared but a short time longer, as a very enterprising and highly respected Belgian, Mr. Polydore de Keyser, of the Royal Hotel at Blackfriars, now a citizen of London, has matured a vast plan by which a hostelry such as can only be paralleled by that called ‘grand’ at Paris will be shortly added to the few handsome buildings to be seen along the river front. This hotel, when completed, will extend from the corner of William Street, along a curved frontage of 380 feet, on to the entrance of the ground at the back of the embankment, sweeping away the gasholders now there. 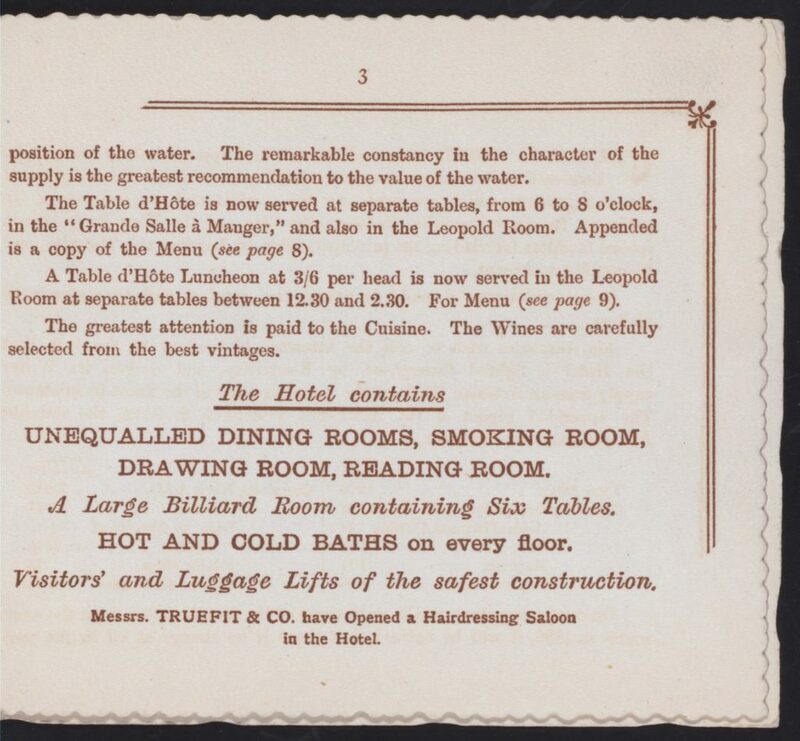 The hotel opened in 1874 and the following print shows the hotel in that year. An interesting feature appears to be a tunnel from the edge of the river allowing deliveries to be made by river, then transported into the hotel underneath the road. If you click on the photo to enlarge, you will see there is a man rolling a barrel into the tunnel. 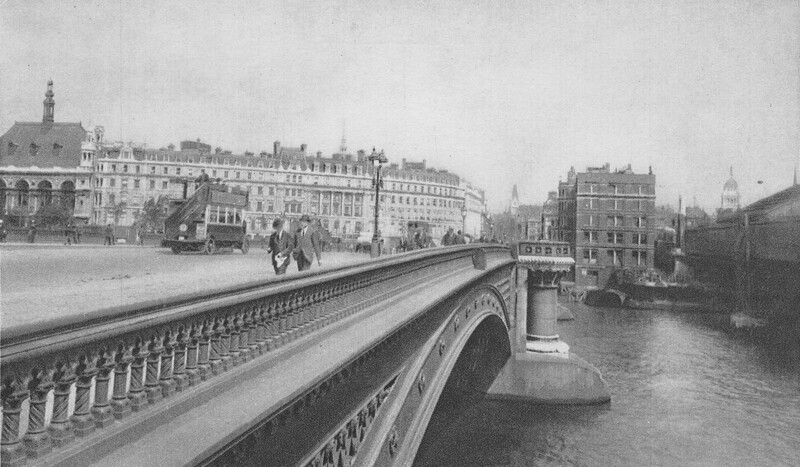 This later photo from the southern end of the bridge also shows the hotel curving round from the Embankment. 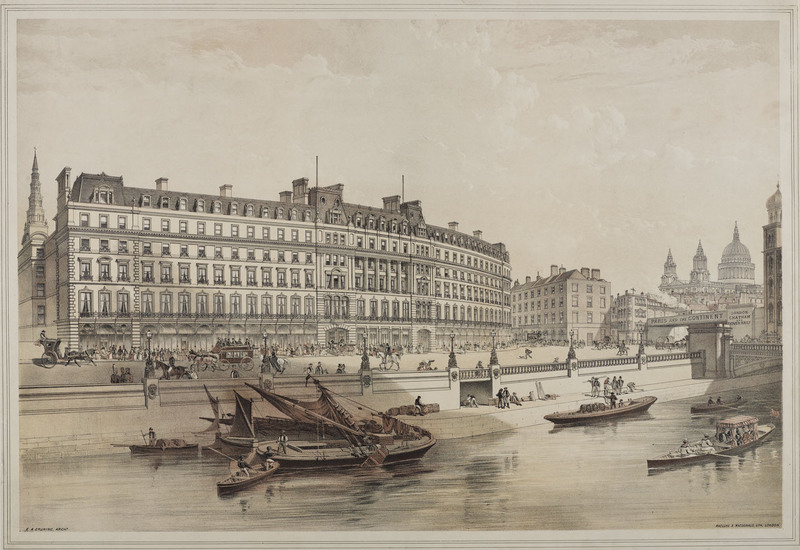 “THE NEW ROYAL HOTEL – The latest addition to the palatial hotels with which London is now adorned is to be found in the new Royal Hotel, at the City end of the Victoria Embankment, which is to take the place of the Royal Hotel in Bridge Street, so long kept by Mr. Polydore de Keyser, representative in the Common Council of the Ward of Farringdon Without. This hotel, now completed, was open to the friends of Mr and Mrs de Keyser on Saturday, and after a pretty thorough inspection of this magnificent building, it may be safely said that in many respects it is altogether unequaled in London or in any of the great Continental cities, not excepting the famous caravanserai in Geneva, Interlaken, and other places to which tourists resort in such numbers. 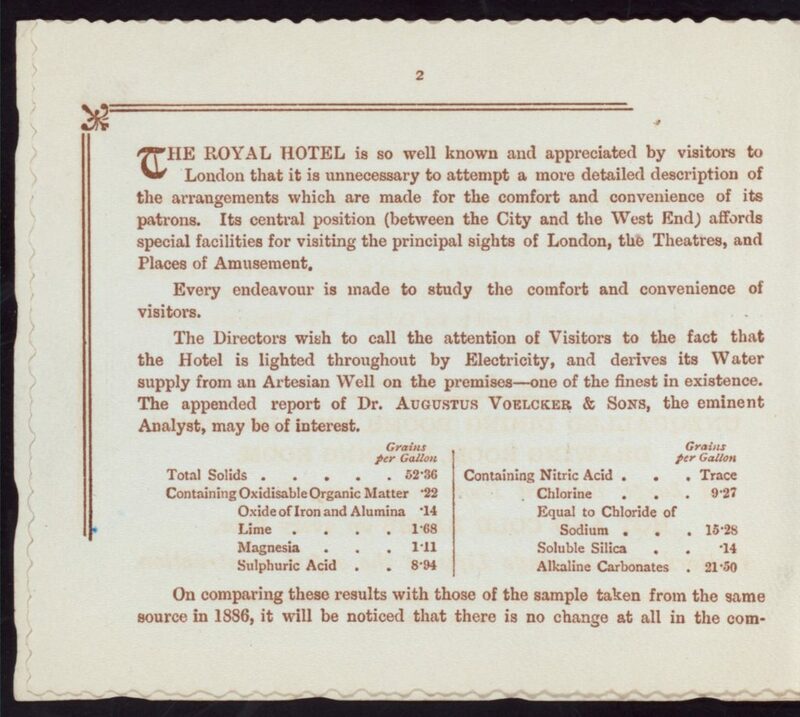 As Mr de Keyser has had ample experience in providing for his numerous foreign and English visitors, and as the internal arrangements have been carried out after his own designs, it may be safely said that nothing is wanting to make a stay in the new hotel agreeable. The view from the front windows over Blackfriars Bridge and the Embankment and over the busy Thames extending to London Bridge on the one hand and Westminster on the other, is most remarkable, and will give anyone a just idea of the immense traffic constantly going on in the metropolis. De Keyser seems to have been involved in numerous other activities as well as running his hotel. In 1875 he was elected to the Committee of the Hotel Keepers’ Association and in 1876 he was on the London Executive Committee for the organisation of the British exhibits at the Brussels Exhibition. It was at this exhibition that he would meet the Prince of Wales who declared himself “well pleased with the British section in all respects”. I get the impression that de Keyser was a master of the art of networking. In 1877, de Keyser was elected as a Common Councilman of the Ward of Farringdon Without and in 1882 he was elected as an Alderman of the same ward, although this was not an appointment to which everyone agreed. There were two protests against de Keysers appointment, one by Mr. ex- Sheriff Waterlow who was the unsuccessful candidate and one by Mr. john Hill and other electors of the ward, on the grounds that de Keyser was an alien born, and that he was the holder of an innkeepers licence. To address these protests, a special meeting of the Court of Aldermen was held at the Guildhall on Tuesday 20th June 1882. He had won the election by over 300 votes so he had won the election fairly and clearly. The final decision was delayed until the first week of July when the protests that he could not be an Alderman as being alien born and holding an innkeepers licence were overruled and de Keyser took his seat as an Alderman of the Ward of Farringdon Without. An example of the activities that de Keyser took part in through his role as an Alderman is a report of a meeting of the inhabitants of the Precinct of St. Brides, held in St. Bride’s Church on Thursday May 22nd 1884 when de Keyser was in the chair. The meeting was held to discuss the impact of the London Government Bill, part of the Municipal Corporations Act of 1882 that was continuing the consolidation of powers from the various Vestries and Wards that had been the traditional holders of local power across London. Despite the meeting’s resolution it was powerless to prevent the gradual centralization of powers across London. 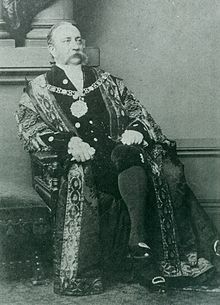 In 1887 de Keyser reached the pinnacle of City of London governance when he was elected Lord Mayor, however the election was somewhat contentious and newspaper reports highlight the fact that he was an “alien” he was “born in Belgium” and that he was “the first Roman Catholic who has been elected to the civic chair since the Reformation”. A rather amazing article which seems to be saying that although we are tolerant, just keep quiet and see out your term as quickly as possible. 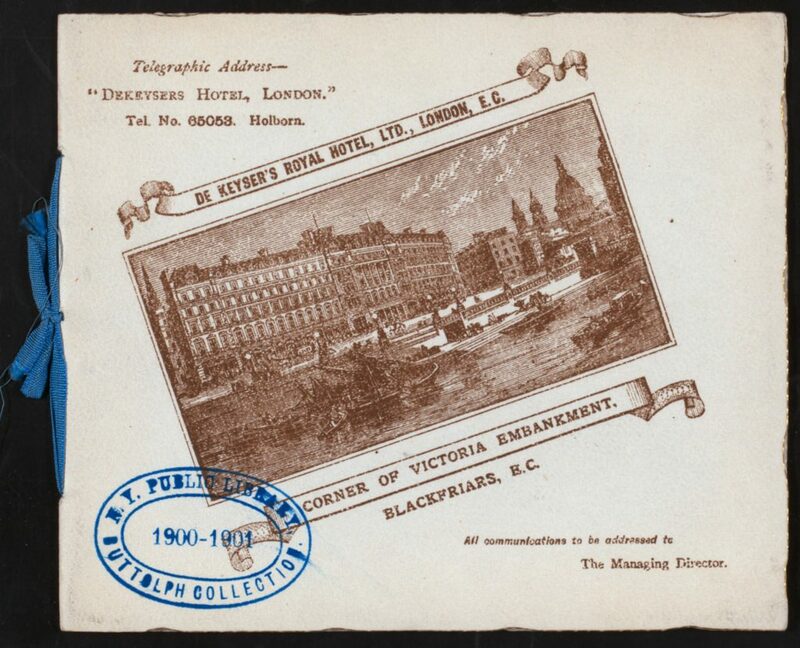 As a Catholic immigrant from Belgium, Polydire de Keyser who started selling Maitrank through newspapers was now the owner of the Royal Hotel, Blackfriars and the Lord Mayor of the City of London – quite an achievement. The following portrait of de Keyser (© National Portrait Gallery, London) shows him in November 1887 at the start of his year as Lord Mayor. During his term of office, de Keyser took part in all the activities expected of a Mayor. There were preparations for an exhibition in Paris, he attended fund raising events (for example a “Smoking Concert” in aid of Police Charities), there was plenty of entertaining at the Mansion House, concerts at the Guildhall School of Music, fairs and bazaars to be opened. In May, probably due to his heritage, there was a reception and dance at the Mansion House for the “burgomasters and aldermen from Belgium” at which there were “over 500 ladies and gentlemen present to meet the representatives of Belgian municipalities, and the guests on arriving were received in the saloon by the Lord Mayor and the Lady Mayoress” – one of the very few references to de Keysers wife, Louise Piéron who he had married in 1862. In August, de Keyser returned to the town of his birth, Termonde in Belgium where the “streets and houses were gaily decorated with the mingled colours of Belgium and England, and the arms of the City of London”. “THE NEW FISH MARKET – The Lord Mayor (Sir Polydore de Keyser) yesterday opened the new Fish Market in Farringdon Street which has been specially erected for the trade by the Corporation of the City of London. The building, which was designed by the late Sir Horace Jones, has been constructed by Mr. Mark Gentry, at a cost of about £26,000. It is situated at the southern roadway leading from Farringdon Road to Long Lane and fronting Snow Hill. 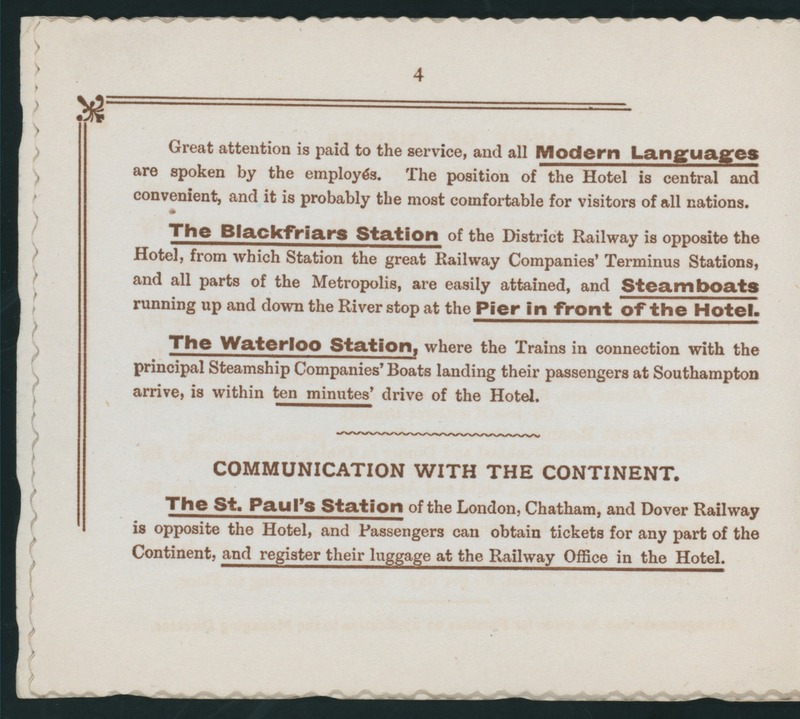 The market, which covers an area of 14,000 square feet, has been erected over the joint lines of the Metropolitan and London, Chatham and Dover Railways. The Lord Mayor, who went in semi-state, accompanied by the Sheriffs (Mr. Alderman Gray and Mr Newton) was received at the principal entrance of the building by the Chairman (Mr. James Perkins) members of the market committee and the Town Clerk. A silver gilt key was handed by Mr. Perkins to the Lord Mayor, with which he unlocked the huge iron gates amidst the cheers of those assembled outside. His Lordship having been conducted by the Town Clerk and the members of the Market Committee to a dais, covered with scarlet cloth, at the southern end of the building. Mr. Perkins, Chairman of the Markets Committee, briefly explained the circumstances which had induced the Corporation to construct the present market. 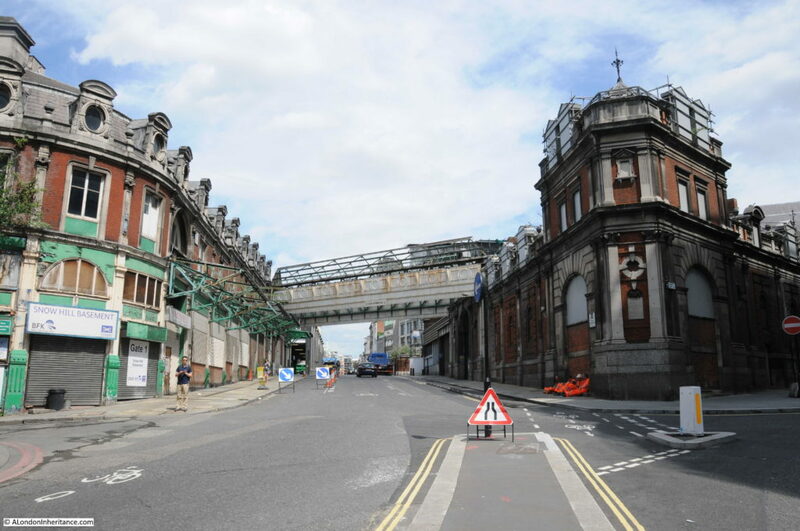 The old fish market on the other side of the roadway, which was originally intended for the sale of fruit and vegetables, had proved a loss to the Corporation of about £10,000 a year. Hence the erection of the present market, Billingsgate having proved insufficient for the supply of fish for the Metropolis. Nearly every shop in the new market was let, and the old market would be used in future for fruit and vegetable. the Corporation hoped that it would be successful, and prove advantageous to the salesman. On the 4th December 1888, de Keyser was at Windsor Castle to receive his knighthood from Queen Victoria. 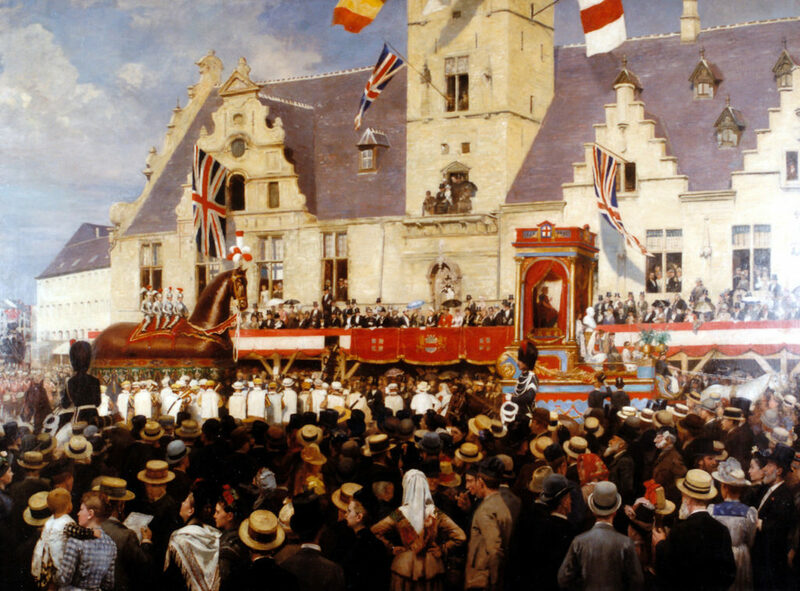 After ending his term as Lord Mayor, de Keyser continued organising British participation in overseas exhibitions. 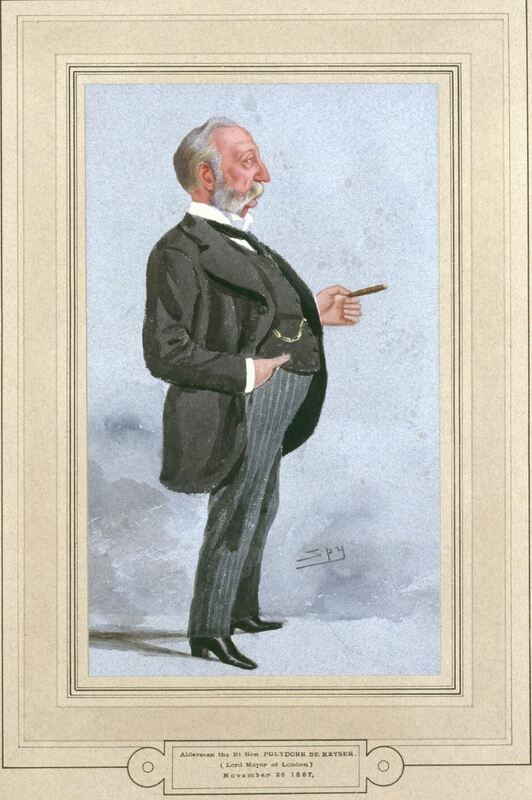 In 1889 he was the Executive President of the British Section at the Paris Exhibition. He also continued his role as Alderman of the Ward of Farringdon Without and in October 1891 was presiding over a meeting of the inhabitants of the ward who were objecting to the letting of any portion of land on the Thames Embankment to the Salvation Army as it would be detrimental to the interests of the City including the concern that “there was no doubt that the processions &c, with drums, trumpets and cymbals, would lead to danger”. In 1892 de Keyser resigned from the post of Alderman on the account of “bodily infirmity” – among other issues, he was going deaf. 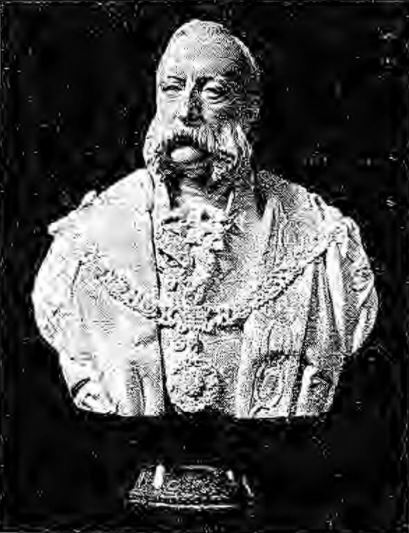 In July 1893 a bust of Sir Polydore de Keyser was unveiled at the Mansion House. It was presented as a token of respect to de Keyser who had played an important part in the affairs of the City and the Ward of Farringdon Without. de Keyser did not have any children of his own, but appears to have had a large extended family, including a number of nephews, one of which he appears to have adopted in some way. In the year before his death, his ownership of the hotel was transferred into a separate company, the Company of de Keysers Royal Hotel Limited. I assume he did this to make the distribution of his assets after his death easier as shares in the company were set aside to provide annuities to various members of his family. His adopted nephew Polydore Weichand de Keyser also inherited an annuity and the residue of his estate. Sir Polydore de Keyser then fades into history. His nephew however continues to play a part both in the governance of the City and in London’s hotel business. So as well as the hotel business, he was also following in his uncle’s footsteps in the City of London. de Keysers Royal Hotel continued in operation until the First World War when it was requisitioned to house officers. I suspect that after the war it had lost much of its pre-war grandeur and the world was a very different place approaching the 1920s than it had been when the hotel was built in 1874. 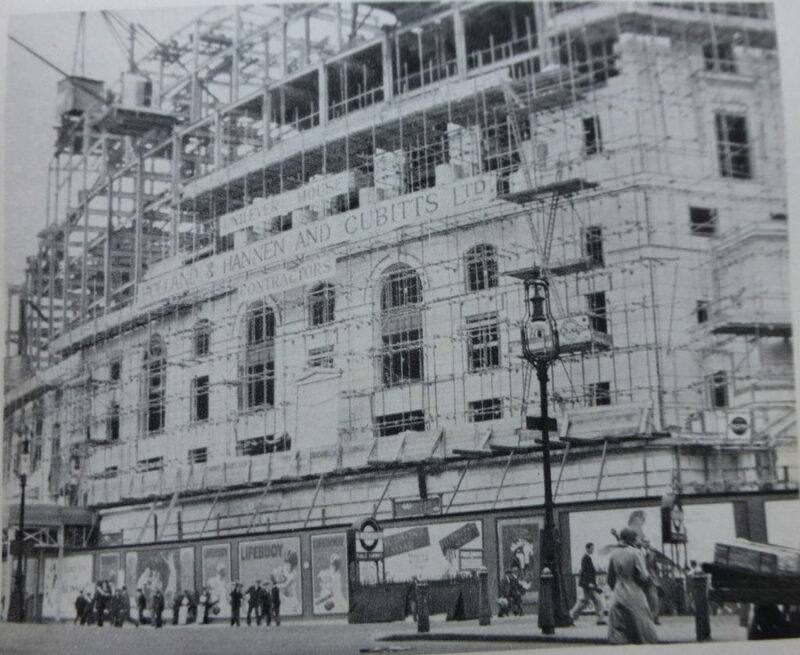 In 1921 it was leased to Lever Brothers who eventually purchased the building in 1930 in order to demolish it, and build their new office, which is still on the site today, and occupied by Unilever (formed by the merger of Lever Brothers and Margarine Unie in 1929). Margerine Unie originated in the Netherlands in the 1890s when Jurgens Van den Bergh opened the first factory to produce margarine. Given de Keyser’s continental European origins it is somewhat fitting that a part Dutch business occupies the same site as his hotel. One final question – why did de Keyser feature so prominently in the Supreme Court judgement on Brexit? The Guardian article explains this better than I can, however in summary it appears that the de Keyser hotel company applied for compensation after the hotel at Blackfriars was requisitioned during the First World War. 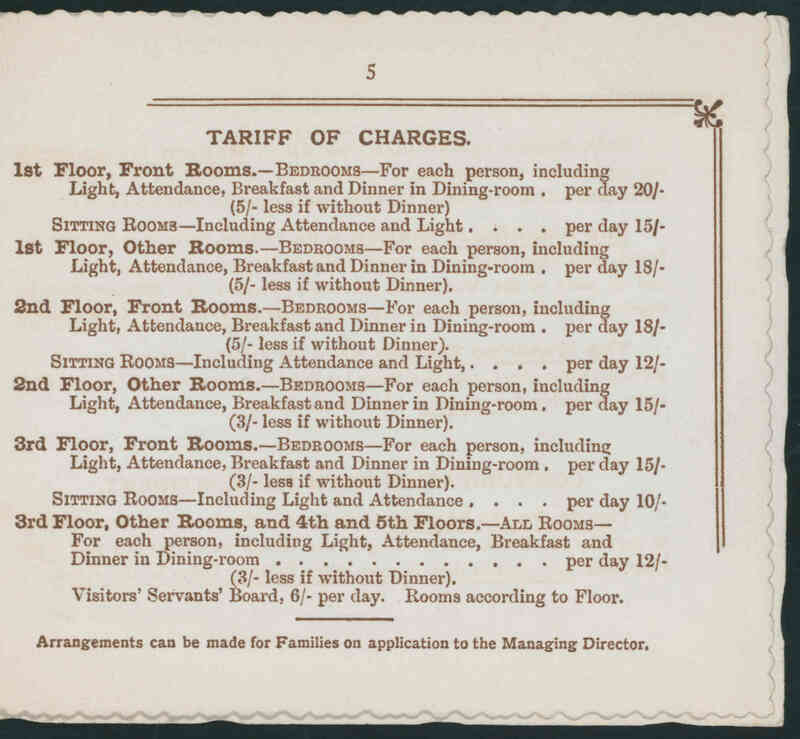 Government did not approve any compensation although Parliament had already set out terms for wartime compensation so it was whether the Government has the right to ignore a decision already made by Parliament, and de Keyser’s judgement of 1920 was one of the landmark cases as the de Keyser Hotel Company successfully sued for compensation. 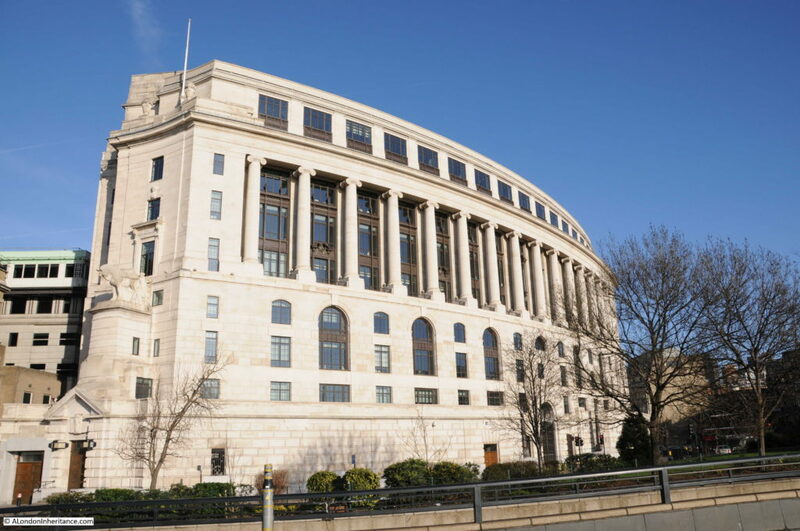 And this is Unilever House today. The curved facade follows the same curve as de Keyser’s Royal Hotel. That is Polydore de Keyser, a fascinating Londoner. An immigrant from Belgium who became Lord Mayor of London and a leading London hotelier. As far as I have been able to check, there have not been any other Lord Mayor’s who came to London as an immigrant since de Keyser. Newspapers only provide a glimpse of his life, but I suspect he must have been highly ambitious and driven to achieve what he did. 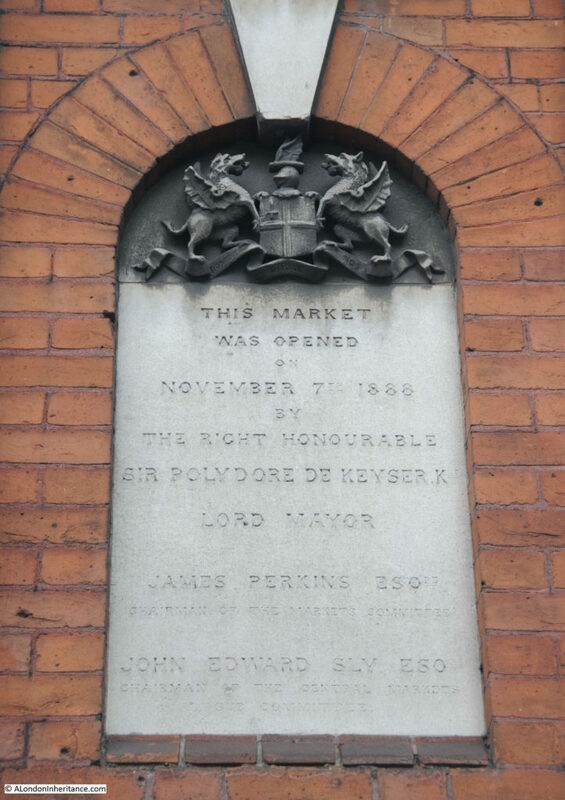 I hope the plaque at Smithfield survives to keep his name associated with the market he opened in 1888. 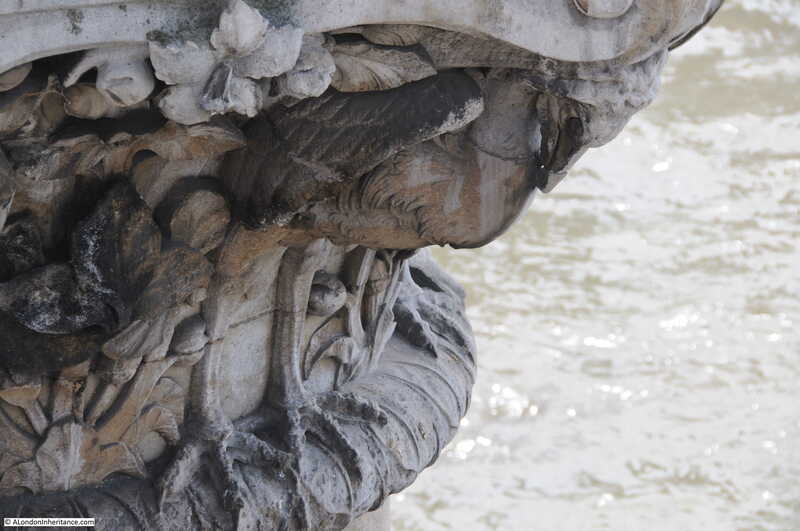 This entry was posted in London Characters and tagged Blackfriars Bridge, Polydore de Keyser, Royal Hotel on July 2, 2017 by admin.